This shower curtain is designed and produced by well-known German brand Kleine Wolke, established in 1968, and is backed by their quality guarantee. A luxury, quick dry and easy care polyester fabric, as used in many high end hotels. Our Naomi shower curtain features a contemporary pattern of vertical lines over a background of white and is available in your choice of either a ruby red or bronze stripe. 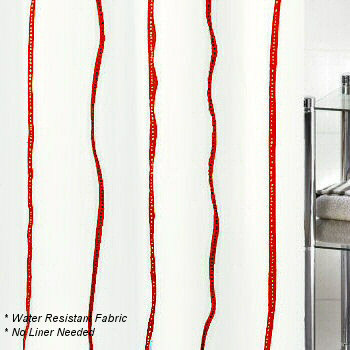 Contemporary white non toxic polyester fabric curtain available with either ruby red or bronze stripes. The stripes do not have a sheen.